* April 1999 — Daulet Bey buys a one-third interest in the duplex from Gregory W. Bloom for $135,000, according to property records. * April 1999 — Daulet Bey takes out a $101,250 loan from Evergreen Moneysource Mortgage. * November,1999 — Daulet Bey takes out another $27,000 loan on the property from Evergreen. * December 1999 — Daulet Bey gives the property to Madeeah Bey for free.July 2001 — Madeeah Bey returns the property to Daulet Bey. No money changes hands. * August 2001 — Daulet Bey gives the property back to Madeeah Bey for free. * July 2003 — Madeeah Bey donates the property to Your Black Muslim Bakery. * May 2004 — Your Black Muslim Bakery signs the property over to Daulet Bey. * September 1978 — J.C. Prater and Annie M. Prater sell the property — a mix of storefronts and apartments — to Your Black Muslim Bakery for $42,000. * February 2006 — Your Black Muslim Bakery gives the property to Daulet Bey for free. * August 2002 — Madeeah Bey purchases the structure — a two-story building with apartments and commercial space — from Gary and Eva Ma for $500,000, using a loan from Lottie Rose. * December 2002 — Madeeah Bey gives the property to Richard Stovall for free. * February 2003 — Stovall gives the property over to Your Black Muslim Bakery. * February 2006 — Your Black Muslim Bakery turns the real estate over to Daulet Bey for free. * August 2006 — Stovall makes a $100,000 loan to Your Black Muslim Bakery. 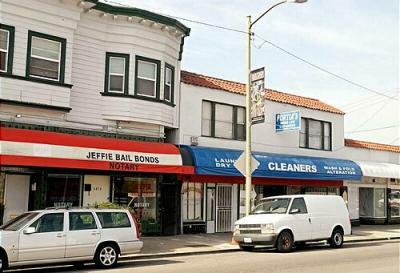 The loan is secured by the 5877 San Pablo Ave. property — even though it’s legally owned by Daulet Bey, not the bakery.